Right across the National Stadium on Rama I Road in Bangkok is the small road named Soi Kasensan II. Jim Thompson's house is 400 meters down along this road. Jim Thompson was an American who came to Thailand during World War II. Here he became fascinated by the Thai enormously beautiful thaisilk, and when the war was over, he began trading with the silk fabric. He came to found the Thai silk industry and was for many years an important man. In 1967 he went on vacation to the rainforest at Cameron Highland in Malaysia where he disappeared without a trace. The house is down by one of the small peaceful Khlong. The garden is full of tropical flowers and trees, and the silence here is in sharp contrast to the rest of Bangkok. The place is interesting but for their beauty, because here you can get an idea how the Thais who were well off lived 100 years ago. The building actually consists of six traditional teak houses that Jim Thompson bought and moved here. He began its construction in 1957 when he bought the oldest building that today is a livingroom. 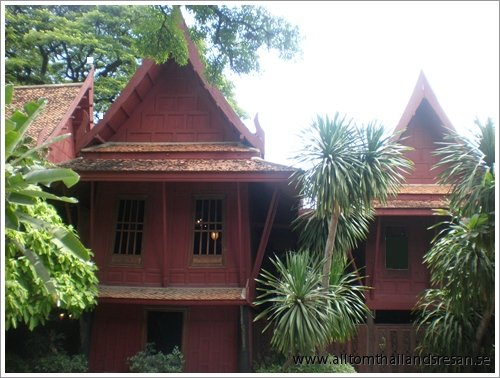 This part is from the 19th century and was originally a weaver family who lived on the other side of the khlong. The whole building was finished in 1958. All six parts of the houses have traditionally been put together without nails. The original intention of this was that the family easily could move part or parts or the whole house. 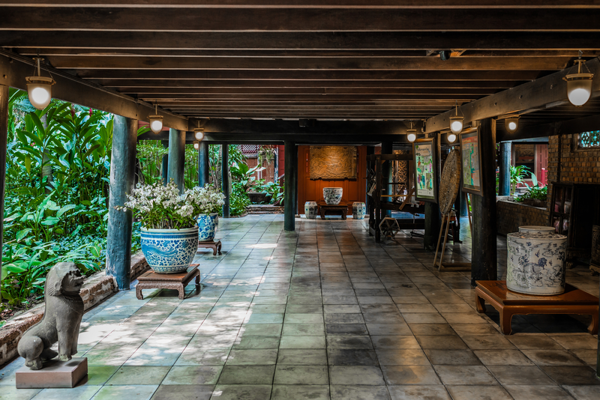 Unlike the traditional Thai homes, Jim Thompson's House, an interior staircase, another difference is that Thais would let the rooms be separated by an open corridor. It is not allowed to walk around on your own in the house, since some treasures have been stolen. The tour begins, as a rule, in the garden, which is located right next to the khlong is a small spirithouse. One of ceremonies associated with house building is to build a residence of spirits. This ceremony is performed by monks and should take place before the construction workers begin their work. Right next to the building's entrance stands a torso from the 500's, it is considered one of the earliest Buddha statues discovered in Southeast Asia. Entrance's floor is of Italian marble, as shown by western influence. Remember to take off your shoes, it is a common courtesy in a Thai house, although this is a museum. At the stairs is great pictures that have been painted on cotton fanric. They represent scenes from Buddha's life. By the stairs on the ledge and the dining room are also pictures from the Jataka-the story of Prince Vesantara. It is one of the most popular Jataka stories. The story is about the selfless prince who gave away everything, including his wife and children. The paintings illustrate the 13 episodes from the story. According to legend, the artist who completes all 13 illustrations will die. Therefore, note at this image set is not finished. There are occasional unpainted parts. At the stairs on the first floor there is a sand-stone-buddha that sits on a naga in Lopburi- and khemerstyle from the 13th century. In the dining room there is a collection of blue and white porcelain from the Ming dynasty, as well as a dining table that originally was used for card games at Rama V's time. In the hallway to the living room stands two figures of the Indian God Siva to the left and Uma to the right. both in khmer style, from the 12th century. In the living room, you can tell by looking at the windows that the walls have been twisted around so that what once were outside, now is inside. Also notice the number of toes on the beds and tables there are five toes, it shows that Jim Thompson thought of himself as noble. At the end of the living room is a head of the God who is half man Ardhanari (Siva) and booklets woman (Uma) head is in khmer style from the 10th century. In the room there is two Burmese who turned upside down and used nowadays as lamps. On the desk are two figures representing the "kinnaris" a kind of mythological birds. The bed in the guest room have only three toes. It was intended that guests would not feel as well-heeled as Jim Thompson himself. Porcelincat on the nightstand is a potty for men. 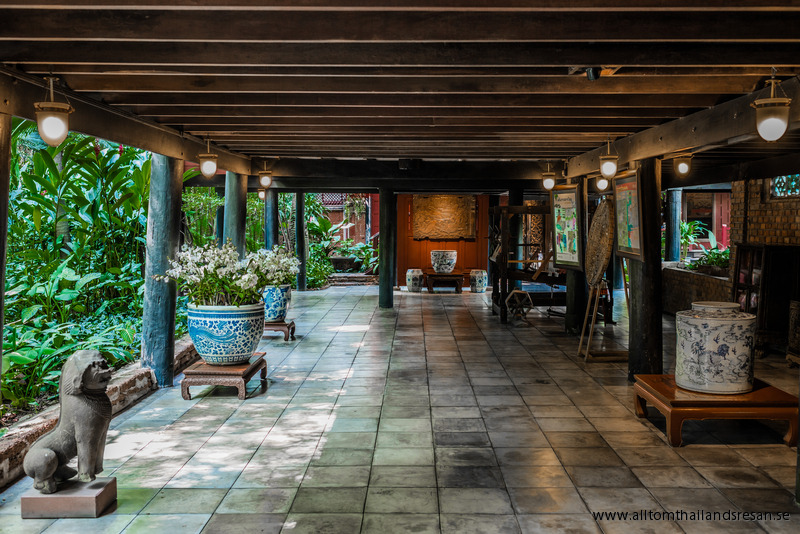 In Jim Thompson's own bedroom there is a mousehouse from Bangkok period (19th century)In the corridor below there is a collection of rare porcelain of type "Bencharong" which means "fivecolored" China has been produced in China after Thai instructions. The first "bencharong" was produced in the 17th century, and production continued to change until Bangkok period. Notice the special teapots uncovered where the water is poured into the bottom. In the Guest House there is some artwork that depicts scenes from everyday life.